New York versus Philadelphia. It doesn’t really need any hype (although, NBC Sports will certainly do their best to constantly remind you that these cities and franchises don’t like each other a whole lot). There’s plenty of history between the NFL’s Giants and Eagles, and MLB’s Mets and Phillies (Knicks-Sixers hasn’t been a relevant rivalry in the NBA since the 1980s). 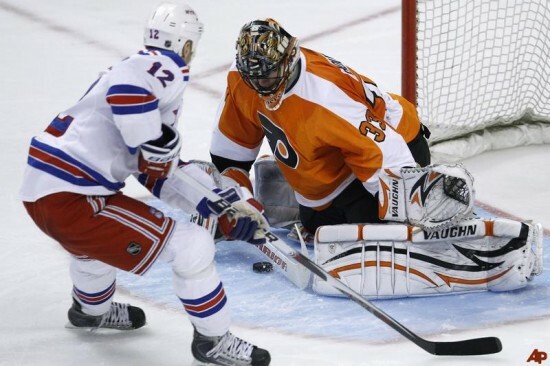 The Rangers and Flyers have had plenty of their own moments and incidents, too. This list may need some alterations after one of these teams advance in the 2014 Stanley Cup Playoffs, but here’s a look at some of the most memorable (or painful, depending on your perspective) and biggest incidents between these bitter rivals. 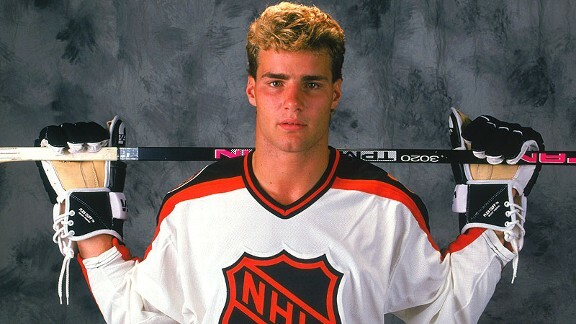 10) Where will Lindros land? The hype that surrounded Eric Lindros coming in to the pros wasn’t seen again until Sidney Crosby. Despite making it clear that he would never want to play for Quebec, Eric Lindros was originally drafted by the Nordiques in the 1991 NHL Entry Draft with the top overall pick. After Quebec decided it would be in their best interest to move him, the two teams that they had made deals with were the Rangers and Flyers. Arbitrator Larry Bertuzzi awarded Lindros to Philadelphia, who gave up plenty to get him: Ron Hextall, Chris Simon, Mike Ricci, Steve Duchene, the rights to Peter Forsberg, first round picks in the 1993 and 1994 drafts, and $15 million. The Rangers offer that never came to fruition included Doug Weight, Tony Amonte, John Vanbiesbrouck, Alexei Kovalev, three first round picks (1993, 1994, 1995 drafts), and $12 million. 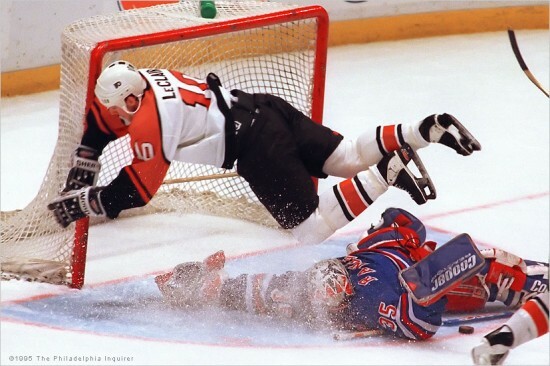 John LeClair and the Flyers soared above Mike Richter and the Rangers in the 1995 playoffs. For Philadelphia, it was their first playoff appearance in the Eric Lindros era. For the Rangers, it was about defending their championship from the previous season. New York barley made it in to the playoffs, but they upset the top-seeded Nordiques in the first round, while the Flyers took out Buffalo in five games. After the Flyers took both Games 1 and 2 in overtime at The Spectrum, they dominated Games 3 and 4 in MSG for the sweep. Philly would lose in six games to the eventual Stanley Cup champion Devils in the Conference Finals. Nine days after the 9/11 terrorist attacks on the United States, the Rangers and Flyers took to the ice for a pre-season hockey game. With the game tied at two during the 2nd intermission, former President George W. Bush addressed the nation at that time. After the teams delayed the start of the third period to watch the speech on the Jumbotron, the game ended in a 2-2 tie without the last period being played – a rare moment of civility between the squads in the City of Brotherly Love. The Rangers and Flyers met five times in a six year stretch during the playoffs in the 1980s. The 1986 edition featured the Flyers, who tallied 110 points in the standings against a Rangers team that lost more games than they won. The series went the distance (Best of Five in the first round back then), and the Blueshirts pulled off the big upset, beating the Flyers in their building to advance to the Patrick Division finals. Philadelphia had beaten the Rangers six out of seven times that season, and came in to the playoffs having won 18 of their last 19 meetings. Besides the upset, it was the Rangers first win in a decisive playoff game (winner advances, loser goes home) since 1928. Henrik Lundqvist stops Danny Briere on a late penalty shot to seal the Rangers 3-2 win in the 2012 Winter Classic. In 2008, the NHL introduced the Winter Classic, an outdoor hockey game played on New Year’s Day. Four years later, Philadelphia got a chance to host one at Citizens Bank Park against the Blueshirts. After jumping out to a 2-0 lead courtesy of Brayden Schenn (his first career goal) and Claude Giroux, it was an unlikely source of offense that tied the game for the Rangers. Perennial tough guy Mike Rupp scored a goal late in the second period and another one early in the third (Brandon Prust and John Mitchell each assisted on both) to battle back. Three minutes after the second Rupp goal, Brad Richards gave the Rangers the lead for good. A questionable penalty shot call in favor of the Flyers saw Danny Briere and Henrik Lundqvist go head to head late in the final frame, but it would be the Swedish netminder who came out victorious. 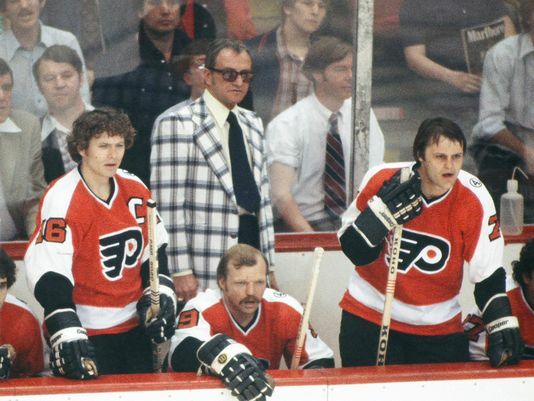 After a successful run as the Flyers head coach in the 1970s that brought two Stanley Cups to Philly, Freddy “The Fog” submitted a letter of resignation to the Flyers front office with one year remaining on his contract after the 1977-78 season. The reason was to coach the team he once played for up I-95 (the Blueshirts gave up a first round pick that resulted in Ken Linseman and cash to avoid tampering charges). In his first season calling MSG home, the Rangers made a run to the Stanley Cup finals (before losing to Montreal), knocking out Shero’s former squad along the way in five games in the second round. It was an early season match between these Patrick Division rivals on October 26th, 1987, but the blood was already boiling between Dave Brown and Tomas Sandstrom. The above incident resulted in a fifteen game suspension for Brown, and a concussion for Sandstrom. Brown was suspended for five games for a previous incident between him and Sandstrom in March of the prior season. The Swedish winger was a known agitator, who wasn’t afraid of using his stick (some felt like he had that coming for awhile). 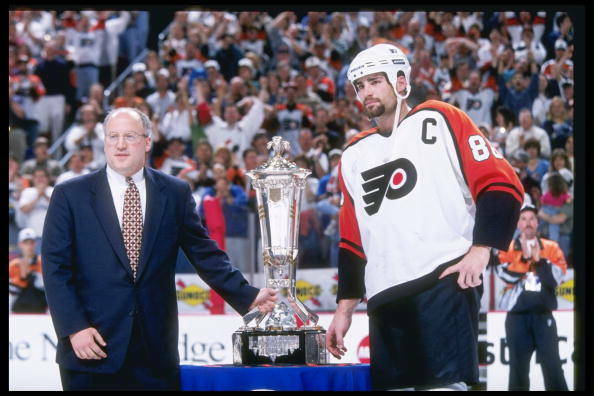 Eric Lindros receives the Prince of Wales trophy. It would be the only time in his career that he would be presented with it. The Flyers were making their second appearance in the Eastern Conference Finals in a three year span. The Rangers hadn’t advanced that far in the playoffs since their 1994 championship season. The Flyers won game one, but a Wayne Gretzky hat trick (his second of the 1997 playoffs, the first one coming in the first round against Florida) helped the Rangers even the series at one. Eric Lindros responded with his own hat trick to lead Philly to a game three victory. Lindros’ wasn’t done doing damage, scoring the game-winning goal in game four with seven seconds remaining. The Flyers finished off the Blueshirts in game five before being swept by the Detroit Red Wings in the Stanley Cup Finals. This would be the last playoff appearance in the careers of both Gretzky and Mark Messier. Olli Jokinen is stoned by Brian Boucher to send the Flyers to the playoffs, and the Rangers home for the season. The way the season ended, it was like a Hollywood script: two old rivals meeting for one playoff birth on the final day of the regular season. The Rangers had put themselves in a position to make the playoffs by beating the Flyers in the opening game of the home and home at MSG Friday night. The Sunday matinee went to a shootout, with Claude Giroux tallying the only goal. The Rangers season was left in the hands of trade deadline acquisition Olli Jokinen (still considered to be a very questionable decision to have him be the shooter), but Brian Boucher’s stop of the Finnish center put Philadelphia in the playoffs. The 7-1-2 run to close the regular season propelled the Flyers all the way to the Stanley Cup Finals before losing to Chicago in six games. This first period fight is one example of why Dave Schultz’s nickname was “The Hammer.” This occurred in Game 7 of the Stanley Cup Semifinals, with the Flyers coming out on top 4-3 en route to their first of back to back championships. This was also the first time an expansion-era team hoisted the Stanley Cup. This is a sore moment in Rangers history (and some sore days literally for Rolfe), because no one jumped in to defend Rolfe against the toughest of the Broad Street Bullies. Former Rangers defenseman Brad Park explains here why no one jumped in to Larry Brooks of the New York Post. This is still regarded as one of the more lopsided fights in NHL history.